I haven’t been feeling up to doing much cooking this week, and what I did make is old hat on this site now. Fortunately, I’ve been saving this post for a bit in the hopes of entering it in Browniebabe #3, hosted as ever by the gracious Myriam. As soon as the last Black Forest brownies disappeared from the fridge, Jeremy started hinting around to get some more. Never mind the strawberry ice cream, the frozen banana mousses, the honeyed carrot cake, fruit sorbets, and boysenberry cobbler. He wanted chocolatey goodness, and the Chocolate Emergency Kit I bought him for our anniversary only went so far in assuaging that craving. I tried to steer him in the direction of chocolate pots de creme, for the sake of variety; he would have none of that, especially after I described it as a sort of pudding or custard. He wanted more brownies. I countered with ice cream, handing him the book to flip through for inspiration; he immediately asked for chocolate ice cream. Now, chocolate ice cream alone is just not my favorite. Chocolate peanut butter is good; chocolate hazelnut is better. But in general, I prefer a more subtle flavor that I can garnish or stuff with mix-ins. I looked (a bit forlornly, I have to admit) at the chocolate ice cream recipe in The Perfect Scoop , wishing for something a bit more interesting to make. And then it hit me: Brownie Batter Ice Cream. It sounded like a chocoholic’s dream to me, and perhaps an achievable one in the wake of cookie dough ice cream’s popularity. A Google search turned up very little besides Ben and Jerry’s, however, and that flavor was reviewed in various places as being more chocolate-fudgy than brownie-batteresque. Now this was a worthy challenge. Because cookie dough intended for ice cream lacks eggs, I began by researching vegan brownie recipes. A few comparative analyses later, I had a good idea what should go into my brownie batter. Of course, there are the basics: flour, sugar, cocoa powder, water, oil and walnuts. The elements that made my batter freezer-friendly, though, were pureed prunes and maple syrup. These two items, especially the maple syrup, resist freezing, and together with the oil, allowed the batter to remain relatively soft and spoonable even after a stint in the freezer. I was a little skeptical when I taste-tested the batter before mixing it into my ice cream. Prunes pair nicely with chocolate, but they still aren’t my favorite flavor, and I could taste them more than I liked. That might have been just because I knew they were there. 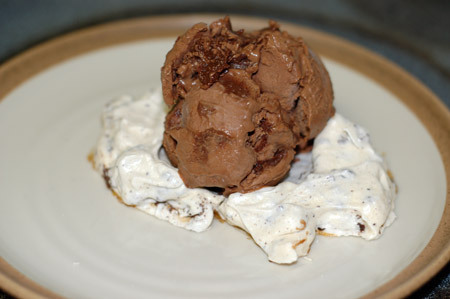 Once the mixed ice cream had cured overnight, I was hard-pressed to pinpoint any prune flavor in the batter. It’s mostly there for texture and a touch of health in this big bucket of decadence. And it worked, because the texture of the brownie batter was perfect and gooey, but distinct from that of cooked brownies or fudge. Heaven for bowl-lickers! In a small saucepan, combine prunes and water and simmer for 5 minutes, or until prunes are soft; allow to cool slightly. Meanwhile, in a medium bowl, combine the flour, cocoa powder, sugar, and salt, and stir until combined. In a blender, puree prunes and simmering liquid with the oil, milk, maple syrup, and vanilla until thoroughly incorporated. Pour the wet mixture into the dry mixture, and mix until just combined. If the batter is still dry, add water 1 T at a time, just until the batter comes together; too much water may make the batter harden more in the freezer. Mix in the walnuts. 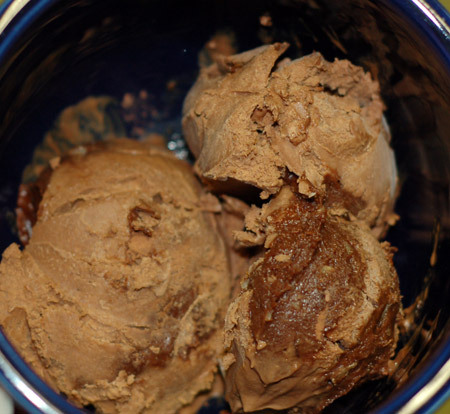 Make up a quart-sized batch of chocolate ice cream (or buy some at the store and allow to soften until stirable, you cheater!) and put a bit in the bottom of your storage container. Dollop a tablespoon or so of brownie batter here and there in the container, covering with more ice cream, and alternating until you have filled the container. You should end up with random blobs of brownie batter scattered through the ice cream. Place in the freezer and allow to ripen overnight for a uniform texture, then dig in. 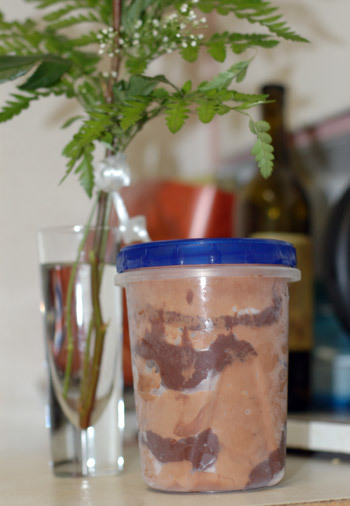 A few more notes: I used David Lebovitz’s recipe for chocolate ice cream, of course! It wasn’t Jeremy’s favorite, but he suddenly seems to be prejudiced against pudding for some reason, and he thought it tasted like frozen pudding. (Most ice cream is custard-based, though, so don’t ask me…) I’ll have to try out the Philly-style chocolate for him sometime, as that doesn’t use eggs. You could certainly make this ice cream even more of a chocolate overload by adding chocolate truffles to it, or topping it with hot fudge, or scooping it onto a brownie… but that might kill you, and it really doesn’t need any embellishment. I did try it on a cacao nib vacherin, and even that was a bit much. I’ll go back to a real brownie for the next edition of Browniebabe of the Month—I’ve got quite a queue of options backing up—but this time I just couldn’t resist. Long live the Browniebabes! Mmmm, it looks delicious! I love hearing how you figured out what works in the freezer to get the consistency you wanted. Soooo chocolatey! What an idea. Great job. I will be trying this very soon. Hendria, if you do try the recipe, please let me know how it works out for you!